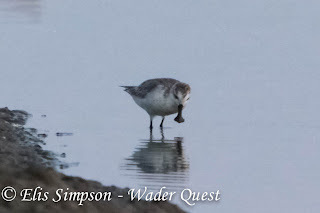 Wader Quest: Another generous donation! We wish to thank David Taylor for his generous donation which has taken us over the £2,200 mark, a great feeling as we now have less than £800 to go, we're nearly there, don't give up on us now people! If you can't decide which worthy cause should benefit from your charity this year, look no further than the newest charity on the block Wader Quest; try to imagine a world with no Spoon-billed Sandpipers in it and give generously! A short time ago I suggested that perhaps some might like to do a bit of collecting on our behalf, getting a quid from each of their friends and family, a small amount that none would really miss and then posting it on the JustGiving site. I thought if 44 people raised £20 each we'd hit our target. Naturally I had to put my money where my mouth was and volunteered to be one of those 44. Well, here's my contribution, just to show I am a man of my word. I have actually run out of family and friends now, but undeterred I will hassle some strangers and maybe people who'll pay for me to go away! £22.00 so far, and I'm not finished yet! With the donations already received since my appeal and my own contribution, we now only need another 39 people to do this, that's 39 people out of the entire world of birders who care enough about saving the Spoon-billed Sandpiper to find 19 other people each (assuming they'll put a quid in themselves) to give them a quid each, and those people don't even have to care about birds, so that's out of a world population of over 7,200,000,000 and rising as you read. Thanks again to everyone who has contributed so far, some more than once! To those of you who are intending to donate, I also say thank you and please don't forget. To those of you who are not sure I say just this... "Oh go on! PLEASE!" To donate click on the spoonie picture.